I have been following Gretchin Rubin’s blog and podcast through her last two books ” The Happiness Project” and ” Better Than Before” On her blog , in 2009, she wrote “I’ve noticed that people often assume that everyone enjoys the same activities that they enjoy, because they believe those activities are inherently enjoyable.” (There is also an interesting happiness quiz in this post). I somehow connect Martha and Gretchen’s thoughts to conclude that our disposition isn’t inherently consistent. We become what we see. We see what we seek. We seek what we think makes us happy. 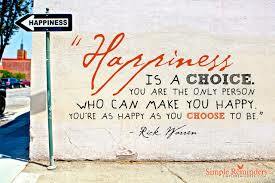 We are happy when we believe we are happy or if we believe we are happy then we are. It is that simple and that difficult. Every day we get to go on an adventure of our choosing (either in our life or in our imagination or both). As we seek happiness, it manifests itself in new ways. If observant new people appear with a smile or a chuckle. If watching a scene of glee plays out in front of you. If careful, you will take in an opportunity, small or large, to brighten another’s day. If diligent you will find purpose for today, which is where true happiness resides.